As many of you may now know, Marvel Comics superhero Captain America was gunned down by a sniper earlier today at the ripe old age of 66. The eyes of geeks worldwide were misty behind horn-rimmed glasses, but I can honestly say that I was not among them...because I wear contacts. 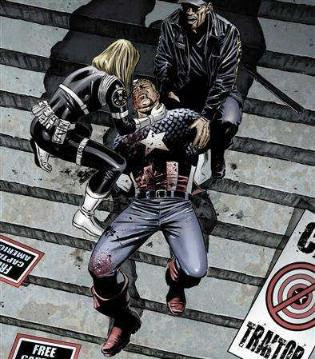 Following a brutal (and, in many ways anticlimactic) civil war between Marvel heroes, Cap, real name Steve Rogers, was taken out not by a supervillian but by a sniper, who downed the one-time World War II hero in front of a courthouse. The death of this iconic character has stirred up a frenzy of media attention as fans clamor to get their hands on as many copies of Captain America # 25 as possible, which became available with two variant covers today. But in the end, what does it really mean? Is Marvel symbolizing the death of the American "dream?" The name of the story arc (of which this issue is just the first part) is even entitled "Death of a Dream." Or is it merely a ploy to boost sales of a hero whose sales have not ascended to the ranks of the Spider-Man and X-Men titles? This remains to be seen. Undoubtedly, Marvel has big plans following this shocking turn of events and may even be looking for a new character to don the stars and stripes and carry his iconic shield on their back, better reflecting modern times. Or, they could just resurrect him and pretend this never happened, much like Superman's "death" in the early 90s. Keep reading true believers. 'Til next time, make mine Marvel.